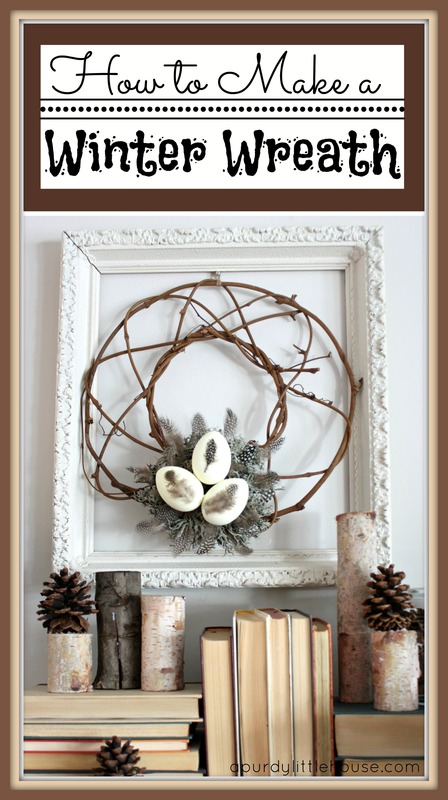 This Winter Wreath was easy and quick to put together, and I think it could be the perfect piece to transition from Christmas through Winter and right into Spring (with the bird’s eggs and all…). 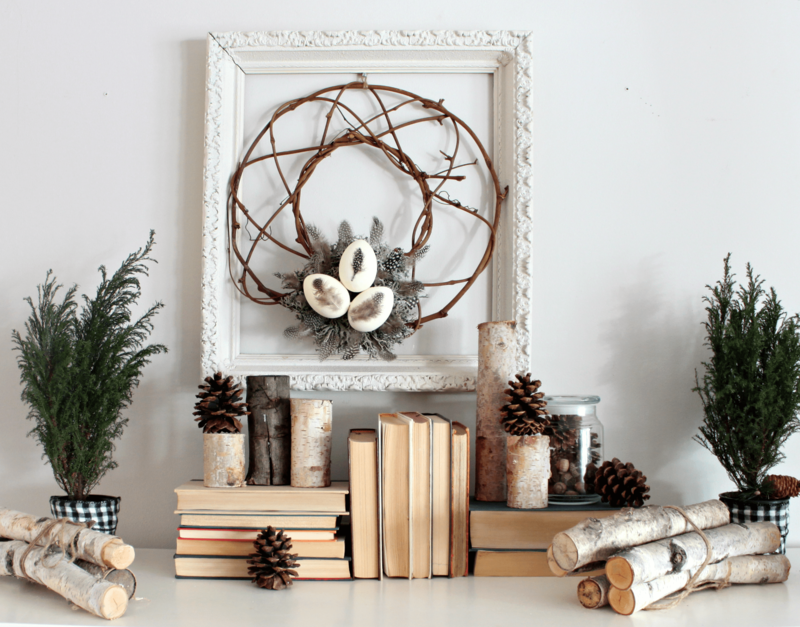 I have several closets FULL of holiday decor and craft supplies, along with bins and bins of knick-knacks that I swear I’ll use one day for a project (I really will…. maybe…probably…). 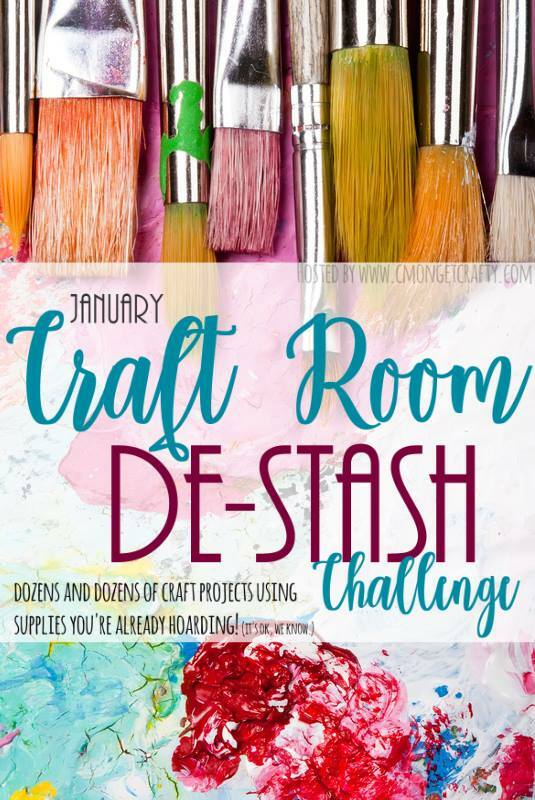 So, when Megan from C’mon Get Crafty came up with the idea of the January Craft Room De-stash Challenge, I knew it would be a perfect opportunity for me to use up some of my craft supplies that have been patiently waiting for a project. 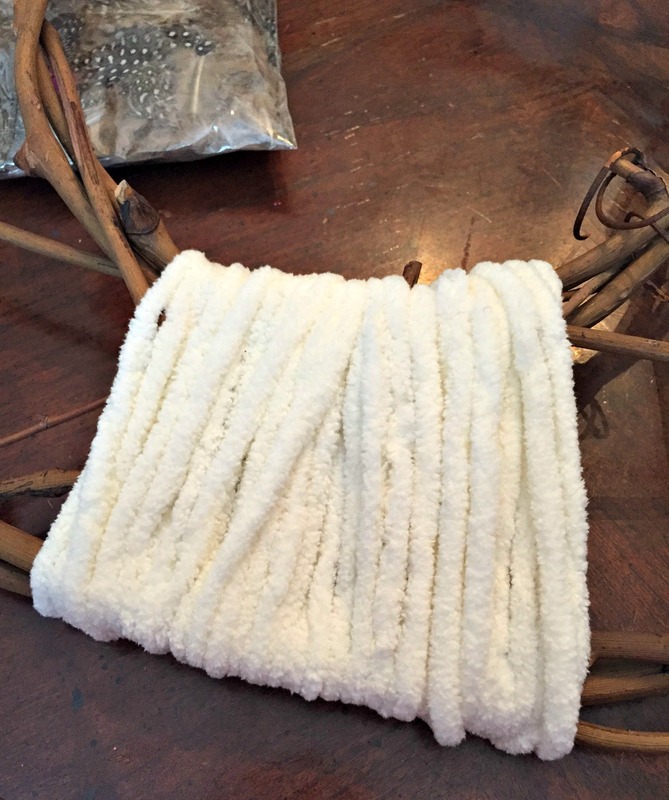 Tons of hoarders bloggers like me have joined up to de-stash their craft supplies and we’ve all come up with a unique project using items we already had on hand. 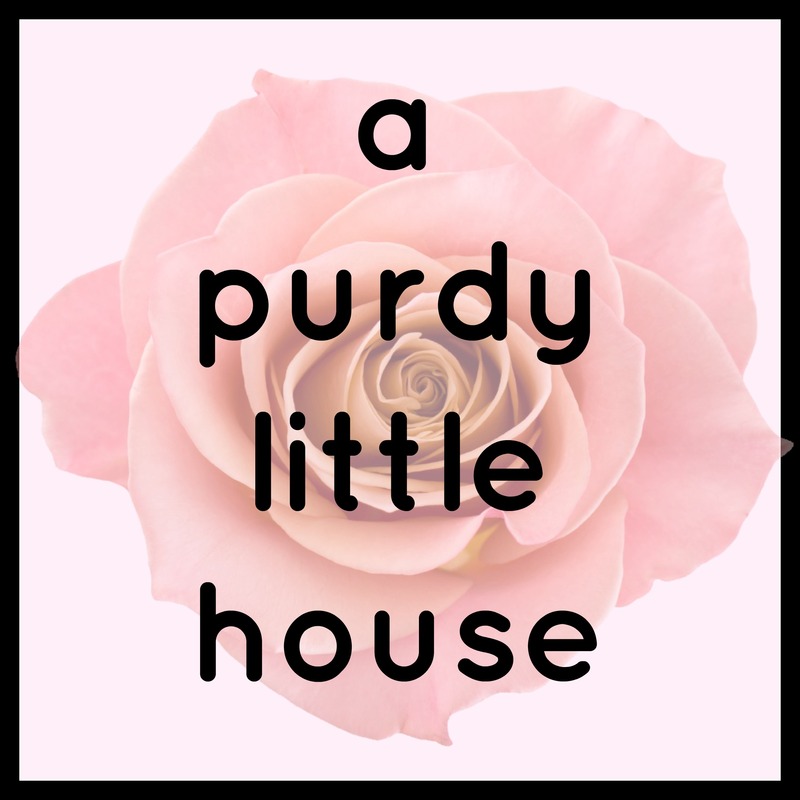 Be sure to give them some love and check out all the other projects featured at the bottom of this post. 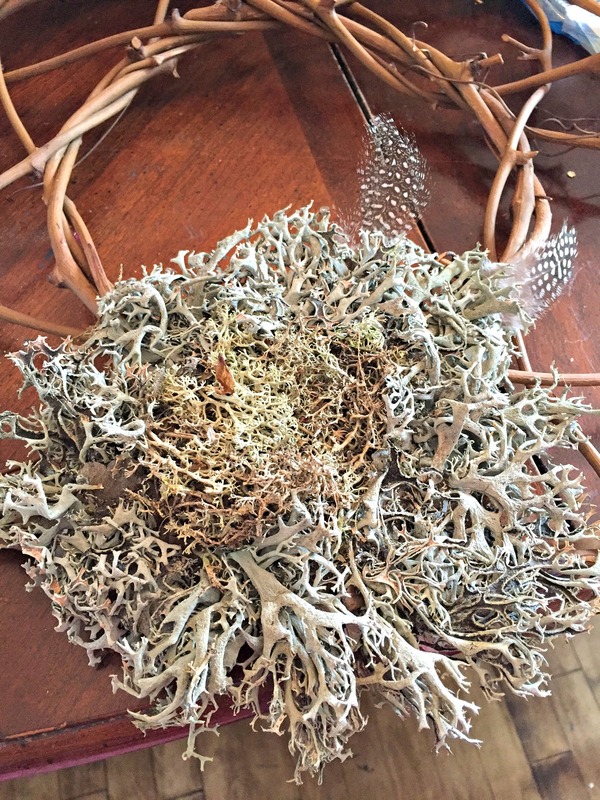 I had to add something to the sparse grapevine wreath form to act as a base to secure the moss (which will be the nest). 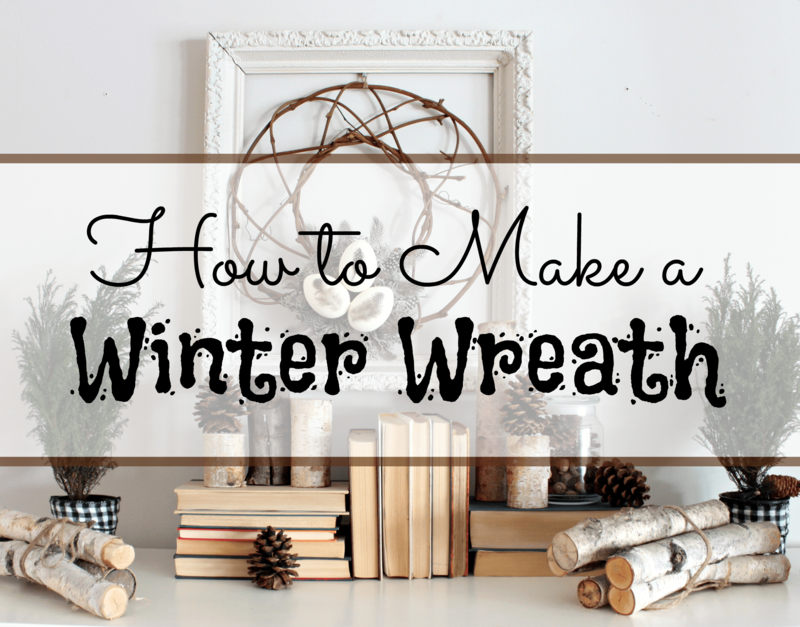 I tied some thick yarn to the wreath and wrapped it around a whole bunch of times. I then hot glued it in place. Next, I painted these plastic Easter eggs a cream colour that would better suit my neutral winter wreath tones. Next, I started hot gluing the moss in place. 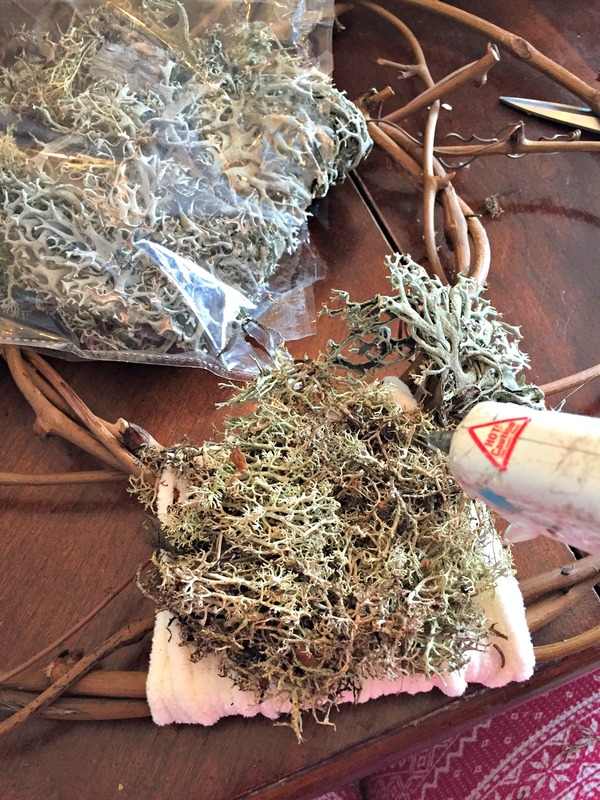 I used two different types of moss that came in the bag. I love that one that looks like coral. So fun, right? I used that one around the edges of my “nest”. Here is the almost completed nest. I added some of the decorative feathers into the wreath just to help tie it all together. 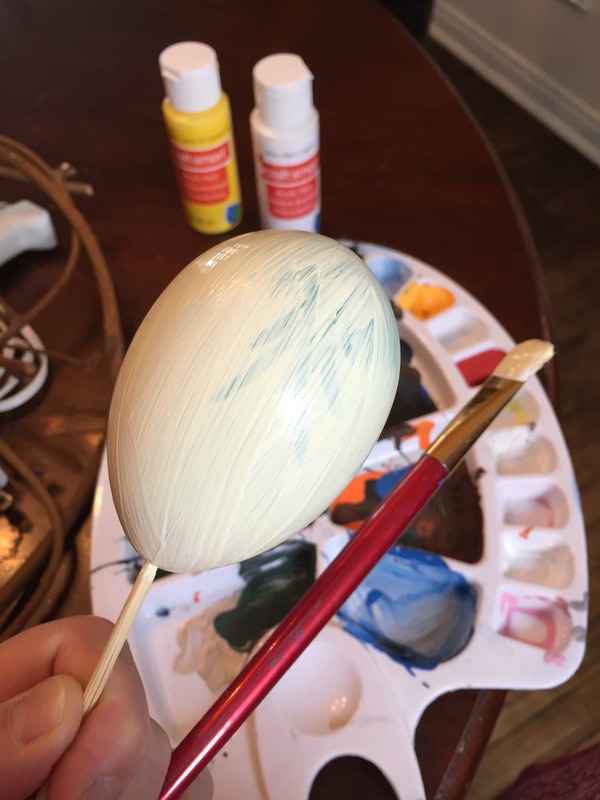 As the second coat of paint was drying on the eggs, I stuck a feather on each egg. 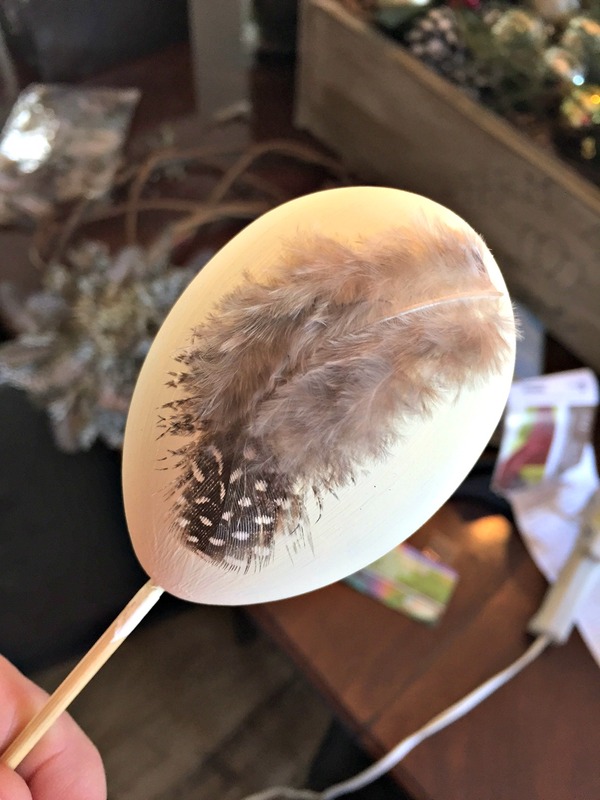 Since the paint was wet, it stuck perfectly and only needed a tiny bit of hot glue on the bottom of each feather. 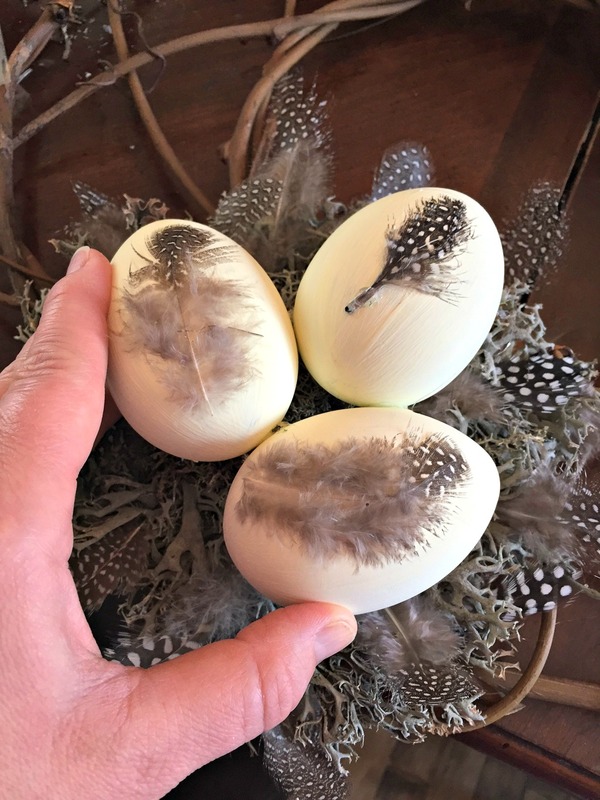 For the last step, I hot glued the eggs right on to the nest and added a little dollop of glue between each egg so they were also secured to each other. Here is the completed wreath. 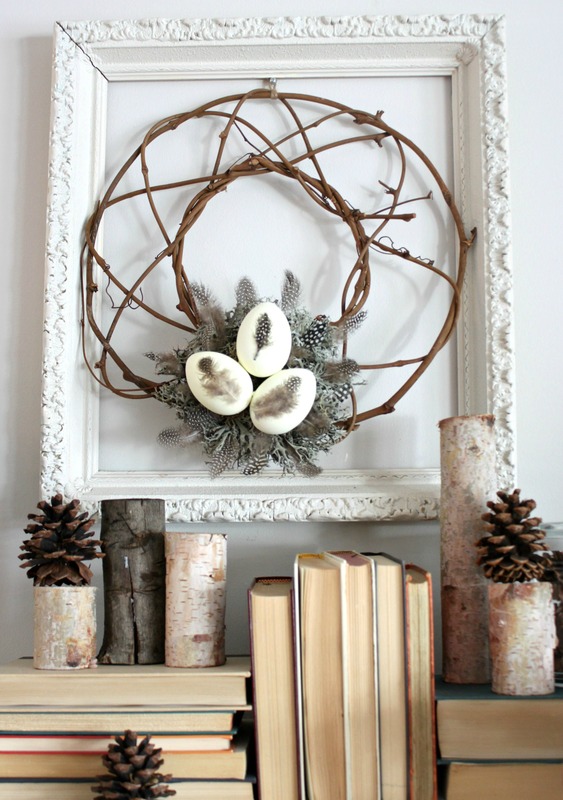 I love the bare grapevine wreath form, as it reminds me of twigs in the winter. Here is the whole fireplace display (pay no attention to those cabinets on either side of the fireplace. That’s a project in the works currently ;)). 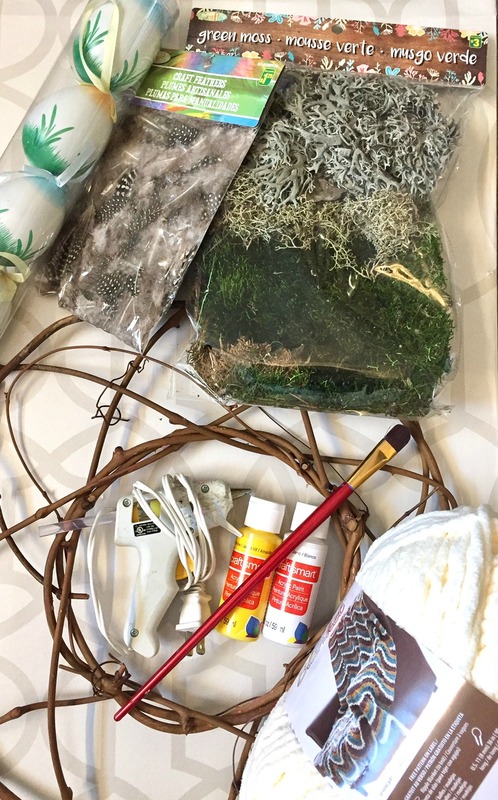 Be sure to check out all the amazing craft projects from bloggers who have also cleared out some space in their craft stash. Lol. I know what you mean. I could probably do a craft for every day of the year and still have supplies left over. Oh I love this so much! Its simple, yet perfect! This is so pretty and will definitely take you from winter into spring. It is simply lovely. 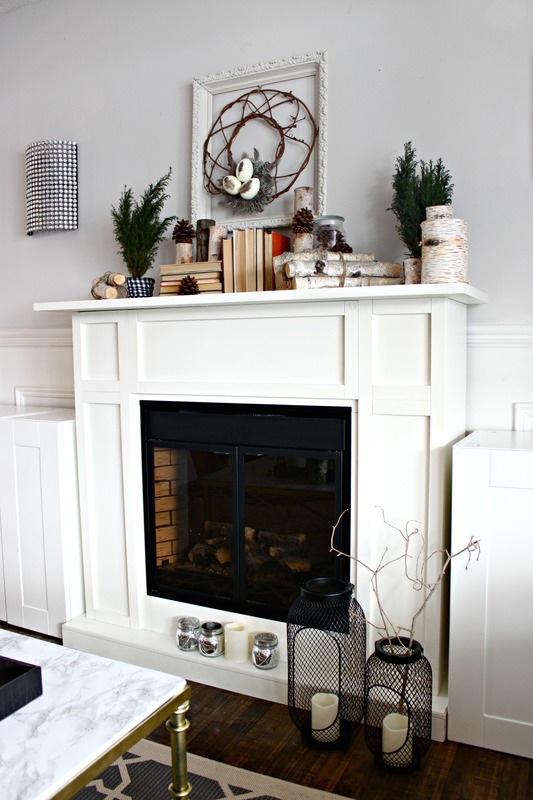 What a great winter wreath and I love how you decorated your mantle. Thanks for the inspiration. Thank you Denise. I love old books and I try to use them whenever I can. Super pretty! Sharing. Visiting from Crafty Destash. Thank you so much for sharing. Ditto with your fabulous fabric hearts. Sue, this wreath is gorgeous! You are so creative!! Awe. Thanks so much Michelle. Right back at cha! This is adorable. Love those eggs. Feathers are perfect! That is so clever and very pretty!